with bird-like space ships similar to Kareeta. 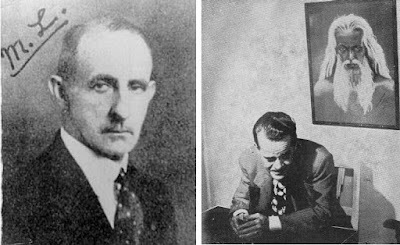 1947 has gone down in history for Kenneth Arnold's June sighting launching the modern UFO era, however, in 1946, seven months before, another report was making international news. And while Arnold's mysterious objects were merely unknown, the San Diego object was identified. It was a space ship from another planet. Meade Layne launched The Round Robin in 1945, "A Bulletin of Contact and Information for Students of Psychic Research and Parapsychology." It was the foundation for "an association of spiritualists and parapsychologists, New Thought writers and Theosophical thinkers... their field of research 'the borderlands' of science, those murky areas where quanta overlap with spirit..." It later came to be known as the Borderland Sciences Research Associates. Layne and many of his friends were also interested in "the data of the damned," following in the footsteps of Charles Fort. 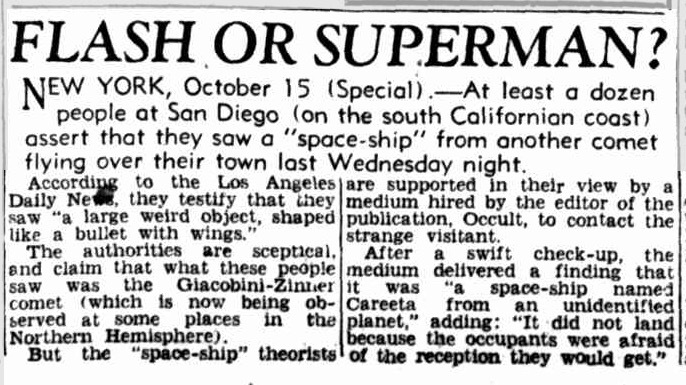 "On the evening of 9 October 1946, a bulletish, winged structure appeared over San Diego... Among those who witnessed this mysterious object was Mark Probert... (Meade) Layne suggested Probert establish telepathic communication—which he did. He learned: The strange machine is called the Kareeta... powered by people possessing a very advanced knowledge of anti-gravity forces... The people are nonagressive and have been trying to contact the earth for many years." Are Men From Mars Knocking? 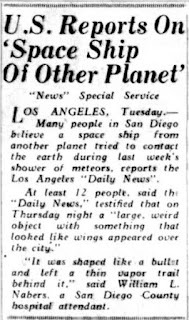 The Los Angeles Daily News thought the message made a good story and headlined its article on the incident: "Are Men From Mars Knocking?" According to the story there was a machine in the sky called a "Kareeta" piloted by creatures from outer space that were seeking contact with earthmen, but wary of the hostile instincts of mankind. The pilots of the "Kareeta" according to Probert, sought a meeting with earth scientists at an isolated location. While most other papers didn't mention aliens from Mars, the term "space ship" was prominent in most of them. The story was carried by wire services across the US and also in newspapers around the world. Space ships were the stuff of science fiction, and the most recognizable names were from the comic strips. 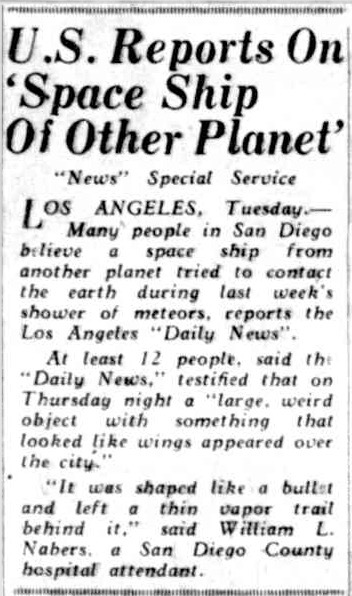 This headline refers to space travelers, Flash Gordon, and the first alien hero, Superman. Meade Layne in The Round Robin from Oct. 1946 gave a report far beyond what the newspapers printed, the full story of the Kareeta sighting, additional witness testimony, and psychic Mark Probert's channeling of the messages from the space visitors. "This ship comes from west of the moon... Yes, these people come in peace . . . They are much more advanced than you are..." Layne had only one doubt about the encounter, that the beings within the spaceship might not be trustworthy. "The account of the Kareeta, received clairaudiently by Mark Probert, may be an elaborate hoax by the communicating intelligences." "'Space-ship' Kareeta has come and gone, but is not yet, we are glad to say, wholly forgotten. The Editor's mail bag shows that Round Robin readers, at any rate, do not dismiss such happenings as trivial and fantastic... The literature on mysterious sky-visitors is extensive - and appalling; if you don't believe it, read Charles Fort, and forthcoming articles by Vincent Gaddis, and start collecting the data for yourself." "At the end of God's Book of Ben are several pages of comment which would do justice to Charles Fort and the Book of Cosmogony would have delighted him. I have tried to find evidence that Fort was familiar with Oahspe, but have come to the conclusion that he never read it... Re the 'Kareeta': Oahspe mentions space ships under a variety of names: Abattos, Arrow-Boat, Adavaysit, Airavagra, Avalenza, etc. See Book of Osiris, Son of Jehovih, Ch.1, para. 5 for references to what may have been the nature of Kareeta." 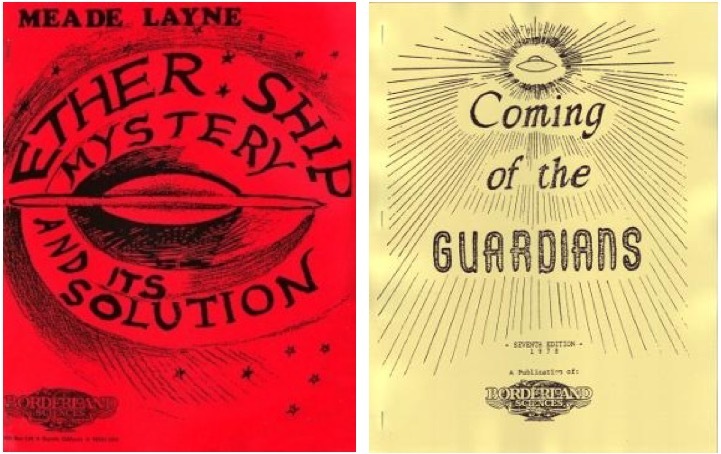 Meade Layne continued to explore the topic of visitors from beyond and took the 1947 arrival of flying saucers in stride. The rest of the world struggled to find out: were saucers secret military weapons, and if so, whose? If not, what were they, and where did they come from? Layne already had it all worked out. His take on flying saucers was a mystical metaphysical one, that they were peaceful advanced visitors traveling here in ships from an etheric and psychic realm. No, they just have scrapbook on UFOs. 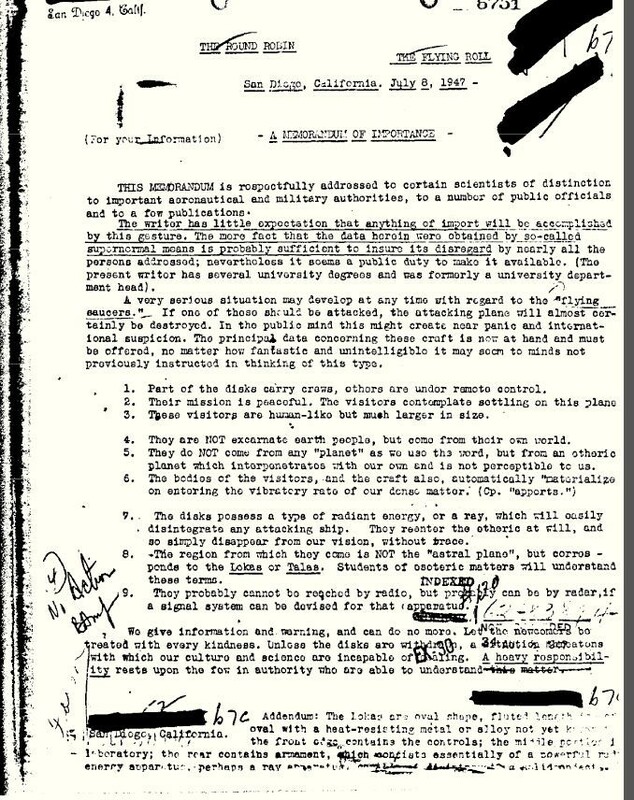 Layne's Round Robin article on the nature of the Etherians creates a stir every time it gets rediscovered in the FBI's files by people who mistake it for a government memorandum. It is not. 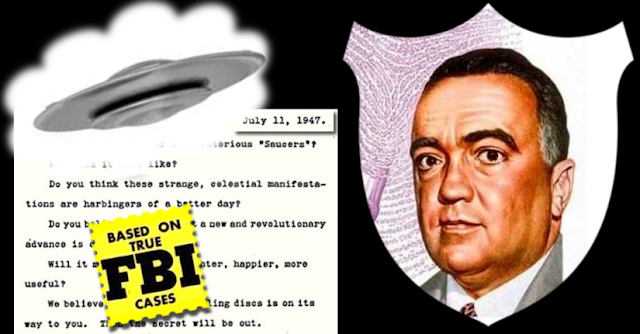 The FBI, CIA and Air Force are among the US government agencies that have articles from UFO magazines in their files. The FBI's copy of Meade Layne's article. Click link for larger copy at the FBI site. "Part of the disks carry crews... Their mission is peaceful... 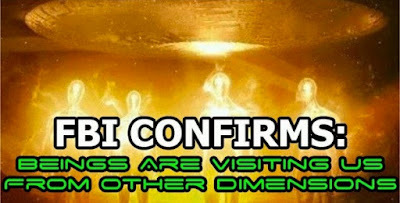 These visitors are human-like... but come from their own world... They do NOT come from a planet as we use the word, but from an etheric planet..."
Amazing if true, but many modern readers failed to note the author stated, "the data herein was obtained by so-called supernormal means..." which referred to psychic communication such as Mark Probert's channeling. Layne neglected to include the 1946 caution that it might only "be an elaborate hoax by the communicating intelligences." Layne's 1955 article Mat and Demat elaborated on the Etherians nature, how they existed in four dimensions instead of our mere three. In the 1950s, Layne's strain of ufology was ignored by the Donald Keyhoe and nuts-and-bolts type ufologists, but the Contactees and their fans were far more open to it. In a sense, Mark Probert was the first Contactee, but since his contact was telepathic, not physical, that honor would go to another Californian. Probert continued his psychic communication and part of his story can be found in the 1957 book, Flying Saucer Pilgrimage. 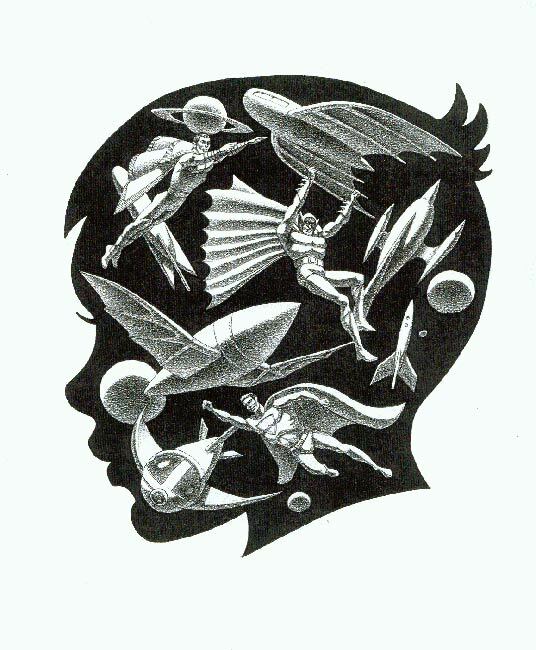 and Its Solution 1950), and Coming of the Guardians (1954). 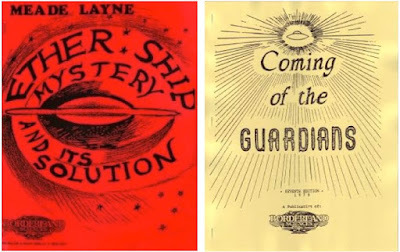 Layne died in 1961, but his 4-D concept of "Etherians" was forerunner to the interdimensional hypothesis and paved the way for Jacques Vallee and John Keel to speculate on occult and paranormal UFO notions a few years later. Within ufology, support for a paranormal origin was rising in the 1970s, but the nuts-and-bolts materialist camp got propped up in a big way by the Roswell UFO crash story. In recent years, the lack of anything tangible to further Roswell or similar cases has caused many UFO seekers to look in other directions. Many of them have turned to a more spiritual path, seeking the positive reassuring messages from above like those from Kareeta and aimlessly drifting towards Layne's murky borderlands. Today, Meade Layne's legacy is carried on by the Borderland Sciences Research Foundation, a California non-profit research and education organization. 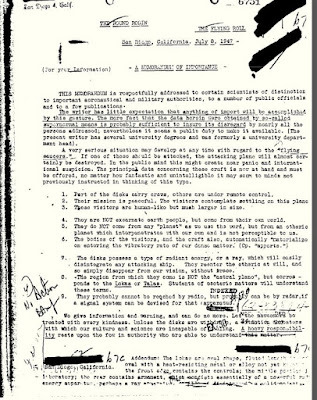 As with so many of the most interesting UFO cases featured here at The Saucers That Time Forgot, Project Blue Book has no file on this incident. So the ship came from west of the moon? What does that mean? Is there a north, south or east in space? If we can agree there's a North Star, then we can work out all the rest from there.